What an incredible turnout for something that just started a month ago! 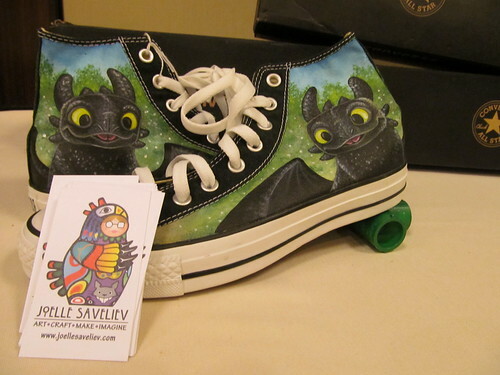 We had about 25 pairs of Chucks up for auction last weekend, and while the overall numbers are still being verified by the accountants, our Charity Services guy says the shoes made "Well over $1000" for the ALS Association! Due to the success of this project, we will definitely be doing this again next year for DragonCon, and possibly even some online auctions during the year, so artists can promote their work on their blogs and such. More to come, and a huge THANK YOU to everyone who donated shoes or their art for this project -- it really is something incredible.